Our Tech Ryan, was on time as usual. I am always amazed at how cordial and efficient every tech has been. In reading the reviews you see people saying that they will be requesting a certain tech. Every tech that has been to our home has been nothing less than super so I would see no reason to ask for a particular one. I also appreciate the fact that if I forget to schedule the pm, then I always get a call that it is time as opposed to just letting it slip by. Always very professional and efficient and it is much appreciated. 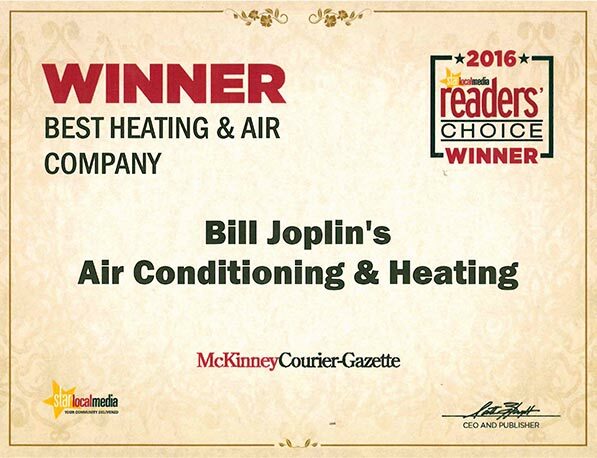 I want to compliment Joplin Air Conditioning on the level of service we have received. We had to replace a Trane 2-ton Condenser and Coil Unit last week. Joplin was recommended by a friend. We also had known the Joplin family since 1980 when we first moved to McKinney. It was sad to hear of Bill’s passing last year. We received the highest level of service from your crew. Specifically Walley R. (Employee # 333), and Travis S. (Employee # 348). They did the install on 5/12/16. Specifically I was impressed with Walley and his mission to enhance Travis’s training and skills. I watched and listened to Walley as he took the time to share his many techniques used to organize the job, what tools to use, then commission and test the new unit. Walley explained to me your management had sent him with Travis and that he was to take time that day to train Travis. He was patient, communicated precisely, demonstrated where needed, and shared his expertise. There were several others on the phone and I should mention Janis Harbin and Jeff (supervisor) who gave us the estimate/finance as all being very professional, as well. It is also a great demonstration of your corporate culture that you hired Travis, a Vet. He learned fast and worked well with Walley. Joplin Air and your staff have “Quality and Put the Customer First” mentally. You should all be proud and I know Bill would be. Joplin’s best of the best. I have been a customer of this company many years and they are the best in the industry. I have used Joplin for many many years. Started in 1981. I am always pleased. Every technician that services our units is thoroughly trained, is able to identify or complete the job quickly, and is polite, personable, professional, and seemed truly interested in making sure we were happy with the service work and product. The last tech showed me pictures from his iphone of dysfunctional parts. They were also neat and tried to keep our house as clean as events would allow. We have used Joplin for 23 years, from time house was built by Darling Homes. Very happy with service as always, including office staff when appts are scheduled & confirmed, then notification is made just prior to service tech arrival. Our air conditioning service experience was very positive. As older people, we feel good about getting through the summer in comfort. If we have a problem, we know we can count on you to help us out with an ac repair. Thanks again. I’ve always appreciated the courteousness of all employees. I get a preventative maintenance service every Spring and Fall and it’s always easy to make an appointment, receive a reminder the day before and I really like that you receive a call when the service technician is on his way. 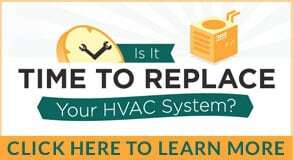 The HVAC technicians always seem very knowledgeable and thorough in all they do. Joplin’s seems to be an air conditioning company that stands by the founders motto “People serving people… honestly… professionally.” Those are the types of people I like to do business with. Bill Joplin’s is one of the finest companies we’ve worked with since building our home in 1995. They have consistently maintained our original systems and were our ONLY choice to replace our upstairs system when the old unit finally died this year. My father was in commercial HVAC in South Carolina for 40 years, so I have experience with the products and terminology, making me a very informed client. Joplin’s consistently exceeds our expectations, sends us great service people, treats us like Very Special Customers and follows through expertly on everything they do. We cannot say enough good things about them!